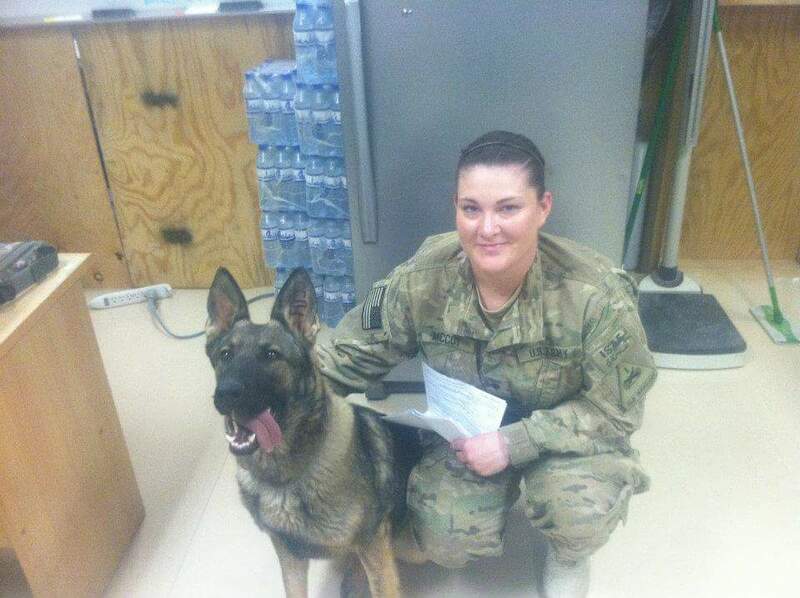 Jennifer in Bagram with Kensji, the bomb sniffer. Recently, Jennifer A. McCoy and I met near her home at Honu Coffee Shop to talk about her U.S. Army experiences and what’s happening in her life since she was Honorably Discharged a few years ago. Talking with her and grasping her strong sense of patriotism and pride in her service to America made me think that just maybe all is well with our younger generation. You’re in the Army Now Jennifer was born Feb. 8, 1989 at Henry Mayo Newhall Memorial Hospital and she grew up in Newhall, California, graduating from Canyon High School in May 2008. During her last week of high school, Jennifer visited our local Army Recruiting Office and she recalls the most pleasant welcome she received as she first stepped through the doorway. You see, there are very few young women interested in military service so those young soldier boys were practically joyful to see her. Jennifer’s cousin, Adrian Rodriguez was a U.S. Army combat medic who served in Iraq and during high school they communicated via Skype and text messaging. Adrian was Jennifer’s inspiration to join the Army, which she did on Aug. 14, 2008. Firebase Shank Soon, Jennifer was off to Fort Jackson, South Carolina, for Basic and Advanced Individual Training and next she was sent to Fort Bliss, Texas, in early 2009. Jennifer’s Military Occupation Specialty (MOS) was 42Alpha, i.e., Human Resources Specialist. Altogether she served four and one-half years at Fort Bliss, but during that time frame she was deployed to Afghanistan via Alaska, Ireland, Kurdistan, and then to Forward Operating Base Shank, just south of Kabul. Jennifer was assigned to Brigade level Human Resources which took her to a number of surrounding military fire bases as her chief responsibility was tracking and accountability of incoming and outgoing troops included those killed in action. When she arrived at Firebase Shank there were 50 soldiers there which rapidly expanded to 3,500 troops. Jennifer’s responsibilities was also handling and accounting for all weapons. Playing Taps After six months at Forward Operating Base Shank, Jennifer was transferred to Bagram Air Base, Afghanistan, where she assisted in coordinating R & R for the troops, along with weapons accountability. While at FOB Shank and Bagram, she recalls that it became fairly normal to hear taps played, meaning that her fellow soldiers were paying the ultimate sacrifice for freedom. It was an eerie feeling for her, as well as the periodic incoming enemy mortar fire. After all, she was in the combat zone which worried the heck out of her mother and sister. Sometimes during phone calls back home incoming mortars would interrupt their conversations sending her mother into panic attacks. “The sounds of combat just freaked her out,” Jennifer said. Initially, Jennifer lived in fear but after a while she adjusted to her dangerous situation. Jennifer McCoy & her pal Lawrence Gooden at Bagram. Chaos in Bagram Following Jennifer’s stint at Forward Operating Base Shank she was assigned to Bagram for several months which proved to be exciting to say the least. Her first day at Bagram coincided with an accidental burning of a small box of Korans by U.S. Soldiers which threw the local Afghanis into fits of fury resulting in numerous mortar attacks and outright pandemonium. Jennifer spent that first night hunkered down with her fellow soldiers in a bunker. Jennifer McCoy at left with her friend Ed Acosta & cousin Adrian Rodriguez. FOB Shank September 2011. Once her Afghanistan tour of duty ended she received a three week R & R sending her back home to Newhall where she was greeted like a hero by her family and friends. Jennifer told me that the Army required troops traveling to and within America to wear civilian clothes as they did not want them to become targets. That, my friends is how low our society has come these days. How sad it that!? Honorable Discharge By the time Jennifer was Honorably Discharged at Fort Bliss, Texas, in January 2013, she had been awarded the Afghanistan Campaign Medal with 1 Star, Army Commendation Medal, 2 Army Achievement Medals, Good Conduct Medal, National Defense Service Medal, Global War on Terrorism Service Medal, NATO Medal, and several service ribbons. Once again when she returned home, it was another big celebration party as she was welcomed like a returning hero. She was so happy. It wasn’t long, however, before she realized that people just weren’t interested in hearing stories of her service so she simply ceased talking about it. “It’s so nice talking to another war Veteran who understands and this interview is very cool, thank you,” Jennifer said we as we spoke. Clearly, that made my day. Sombrero & Margarita Glasses Digressing to Firebase Shank, Jennifer had received a care package from home that included a small sombrero and green margarita glasses which she promptly wore just as Trooper Tony entered the room. He was so amused and taken by her beauty that he pursued a relationship. But, Jennifer initially wasn’t interested. Over time, however, she finally succumbed to his charm and they began seeing each other. Their relationship ended when she left Firebase Shank, however, after her discharge, Jennifer traveled to Fort Bliss to visit her ole Army friends. Tony got wind of her visit which afforded him the opportunity to rekindle their relationship. Since that time they have become very close and she very much looks forward to Tony’s Honorable Discharge next year. The great news is that Jennifer is expecting their child in mid-January and they will marry upon his return home in August 2018. Never Forget the Fallen There are some things that just never leave your brain and for Jennifer, it’s her ole friend Edward Acosta, a close friend she met at Fort Bliss in 2010. Ed had been assigned to South Kabul and was part of a small unit patrol with three other soldiers when their vehicle hit an IED instantly killing two of them and horribly wounding Ed. He was returned to the U.S. for emergency medical treatment including a tracheotomy. Jennifer visited him in the hospital. Ed’s wife and baby girl was there too. When Jennifer held Ed’s hand he recognized her. She also held Ed’s new born baby girl while his wife spent time with him. Jennifer was very worried for Ed and his lovely new family. Later, after returning to Afghanistan, she learned that Ed had passed away March 5, 2012. Jennifer’s thoughts of that time spent with Ed and his family was very special and it’s forever embedded in her mind. Pursuing Her American Dream Meanwhile Jennifer is attending the University of Phoenix pursuing her Bachelor of Arts in Business Management Degree which she will accomplish in 2018. Jennifer aspires to work in Human Resources at JPL or Lockheed Martin and she looks forward to marriage, raising a family and achieving her American Dream. Jennifer, a home grown Santa Claritan, remains very proud of her military service to America. I know what you’re thinking. Yes, Jennifer is THE real McCoy!